This one-day workshop aims to bring together researchers from different disciplines to improve our theoretical, empirical and methodological understanding of the role of institutions and culture in different geopolitical and socio-economic contexts. A growing body of empirical and theoretical work shows that institutions and cultural aspects matter for a variety of economic, social and institutional outcomes, in high income as well as in emerging and developing economies. However, still, at present, culture and institutions are keywords belonging to two distinct research streams that rarely meet to engage in an interactive and constructive debate. This workshop aims to build an ad-hoc research platform for such a debate. We are interested in studies that address the role of institutions, cultural traits, and cultural differences on a variety of economic, social and institutional outcomes. Particularly, we focus on different contributions that institutions and cultural aspects may provide to better understand individuals and social attitudes towards rent-seeking behaviours, corruption, tax evasion, and institutional trust, among others. We are also interested in studies investigating how cultural traits and institutions relate to different forms of economic and institutional performance. Method: 2 or 3 sentences clarifying the methodological approach chosen, and data source, if the paper is conceptual/theoretical state the main framework your research builds on. Key Findings/Insights: 2 to 3 sentences explaining the findings or insights derived from your study. This section should highlight the contribution of your work to the broader literature. Implications: in this section, please state the broader implications of your findings for researchers and/or policy-makers, as appropriate. Authors of accepted abstracts will be notified by 6th of May 2019. There is no fee for attending the workshop. Participants will be offered lunch, coffee and snacks during breaks, and are invited to a closing reception with wine and nibbles. Participants are however expected to cover for their own travel and accommodation costs. Every paper presentation will be assigned a discussant. It is thus important to submit full papers two weeks before the workshop. The seminar will be followed by a social event with drinks and snacks immediately after the seminar at 16.00-17.00. 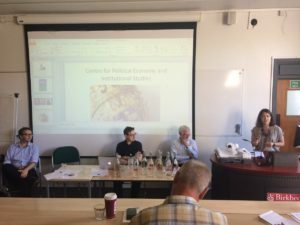 The need for rigorous interdisciplinary research on institutions emerged as the overarching theme of a half-day workshop on 15 June to launch Birkbeck’s new Centre for Political Economy and Institutional Studies. After a welcome from Prof. Sarah Hart (Assistant Dean, Department of Economics, Mathematics and Statistics) and Prof. Philip Powell (Dean of Business, Economics and Informatics and Vice-Master), Enterprise & Innovation, three distinguished guest speakers from the fields of economics, politics and criminology talked about the importance of institutions and political economy for their research. Prof. Stephen Farrell (University of Sheffield) presented preliminary results from an ESRC funded project The Long-Term Impacts of Thatcherism. His evidence showed the scope and limits of historical institutionalism in explaining the Thatcher and Major governments’ shift towards more punitive approaches to crime. Dr Waltraud Schelkle (London School of Economics) presented some of the key findings of her new book, The Political Economy of European Monetary Solidarity. The interplay between domestic and EU institutions rather than economic ideas, she argued, explains why the EU embraced regressive austerity policies in response to the global financial crisis. Prof. Geoffrey Hodgson (University of Hertfordshire) argued for the importance of institutions in understanding international economic performance. Drawing on a range of examples from the economics literature, he discussed, the institutional drivers of China’s remarkable growth rates since the 1970s and the divergent growth trajectories of economies in Asia. The audience brought together students and faculty from three Birkbeck schools with academics from other London universities and political economy practitioners. To conclude the event, the co-directors of the Centre for Political Economy and Institutional Studies – Dr Luca Adriani (Department of Management), Dr Dermot Hodson (Department of Politics) Prof. Ron Smith (Department of Economics, Mathematics and Statistics), Dr Sappho Xenakis (Department of Criminology) – led a roundtable discussion about the origins and aims of the Centre and future activities and events. 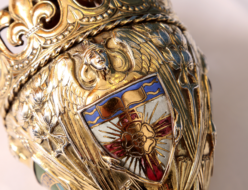 This discussion covered the importance of political economy for Birkbeck’s 200th anniversary and the scope for cross-disciplinary teaching on political economy and institutions. The importance of the Centre for Birkbeck’s research environment was discussed along with the demand from government and private sector economists for a deeper understanding of institutions. The event was sponsored by Birkbeck’s School of Business, Economics and Informatics and the School of Law.